LEGO Friends Stephanie has everything she needs to prepare for the big show where she’ll shine like a star! With the rehersal stage playset, practice her ballet dancing in the big mirror with a balance bar. Then rotate the stage to rock out with a guitar, keyboard, speakers and a microphone. LEGO model number: 41004: Practice until she’s perfect then get ready at the pretty make-up table! Smell the roses delivered to her before the big show as you prepare for the performance with her ice water, a brush and perfume. Once you’re ready, cue the spotlights and start the best show Heartlake City has ever seen! Includes Stephanie mini-doll figure; One supplied; Size H19.1, W26.2, D6.1cm; Weight 0.04g; For ages 6 years and over; EAN: 5702014971721. WARNING(S): Not suitable for children under 3 years old. To be used under the direct supervision of an adult. Stephanie has everything she needs to prepare for the big show where she will shine like a star. Practice her ballet dancing in the big mirror with a balance bar. Then rotate the stage to rock out with a guitar, keyboard, speakers and a microphone. Practice until she is perfect then get ready at the pretty makeup table. Smell the roses delivered to her before the big show as you prepare for the performance with her ice water, a brush and perfume. Once you are ready, cue the spotlights and start the best show Heart lake City has ever seen. This LEGO set Includes Stephanie mini-doll. This toy costs approximately £15.99 (for the latest and best prices make sure you check our retailer list for the LEGO Friends Rehearsal Stage 41004 above). 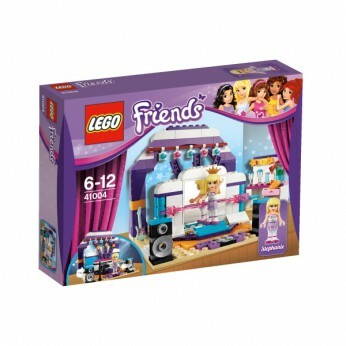 In our review of LEGO Friends Rehearsal Stage 41004 we classed it as being suitable for ages 5 years, 6 years, 7 years, 8 years but recommend you check the manufacturer specific advice before purchasing.